You know when you return from a vacation and you can’t stop thinking about it that it was a good one. This was one of those. 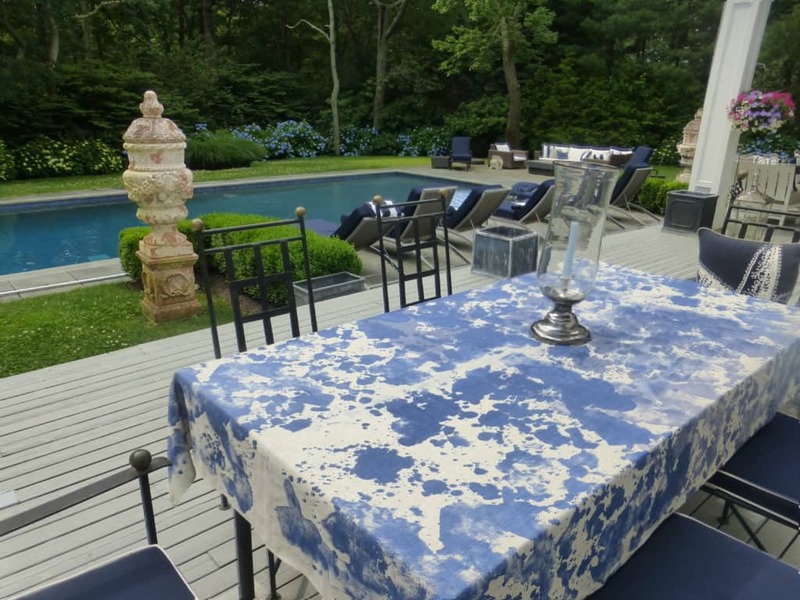 We spent nine days in the Hamptons at my husband’s cousin’s house and I can’t get it out of my mind. 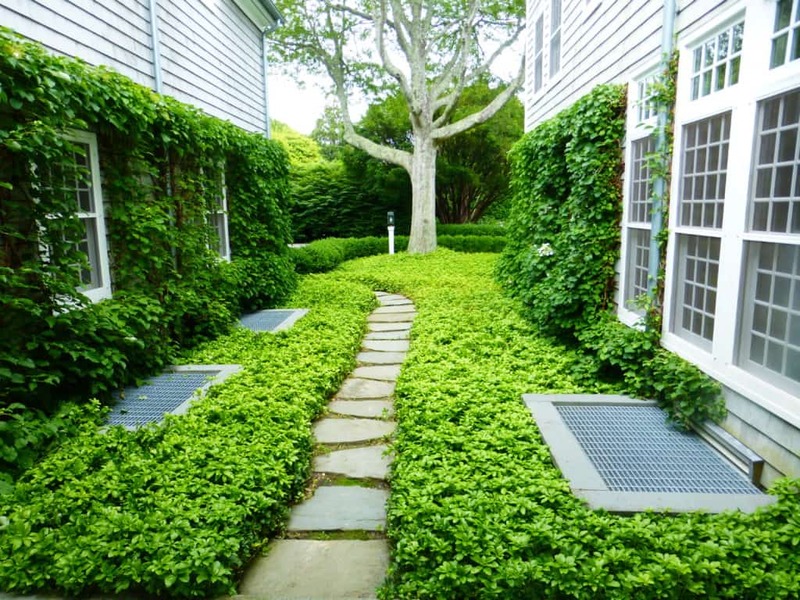 But as I promised in a previous post, more East Hampton garden tour pictures first. 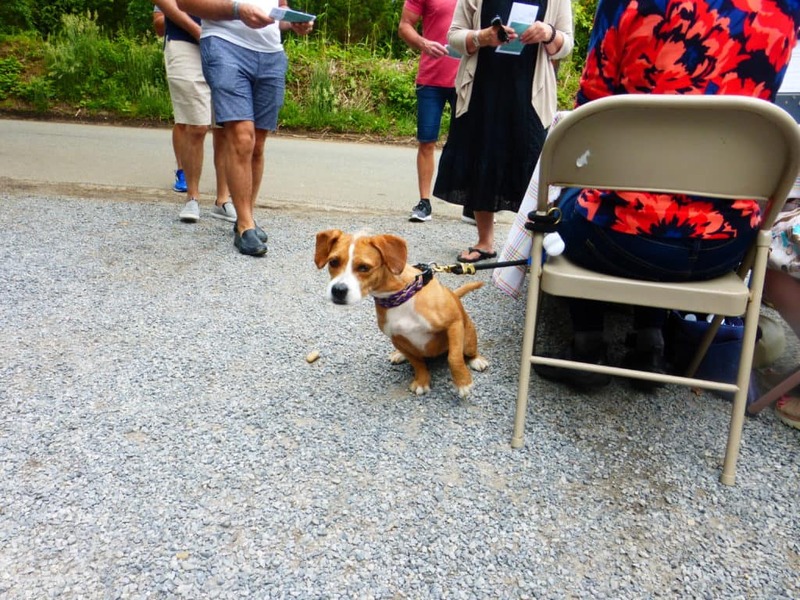 When we arrived, we rushed out the door to make sure we didn’t miss the ARF Garden Tour that benefits cats and dogs. It’s the animal rescue fund of the Hamptons. This little guy was straining to see the gardens too. He was assisting the ladies taking our tickets. But I digress. On with the tour, which was spectacular. Isn’t this entrance understated? So elegant with the fabulous trees, and hedges, but not screaming, “look at me!! !” Well maybe just a little. The entrance led here. 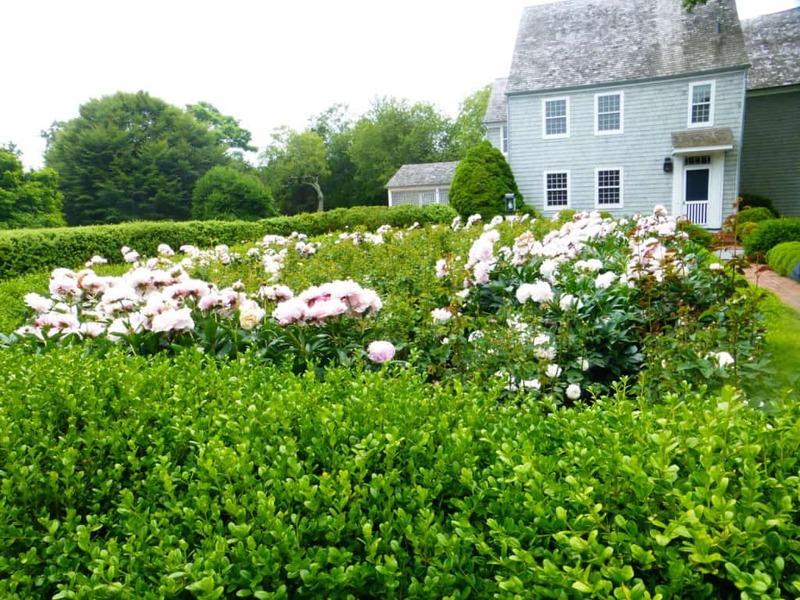 In front of the vintage farmhouse is a bed of rose-edged peonies. Stunning. And then there’s the back. 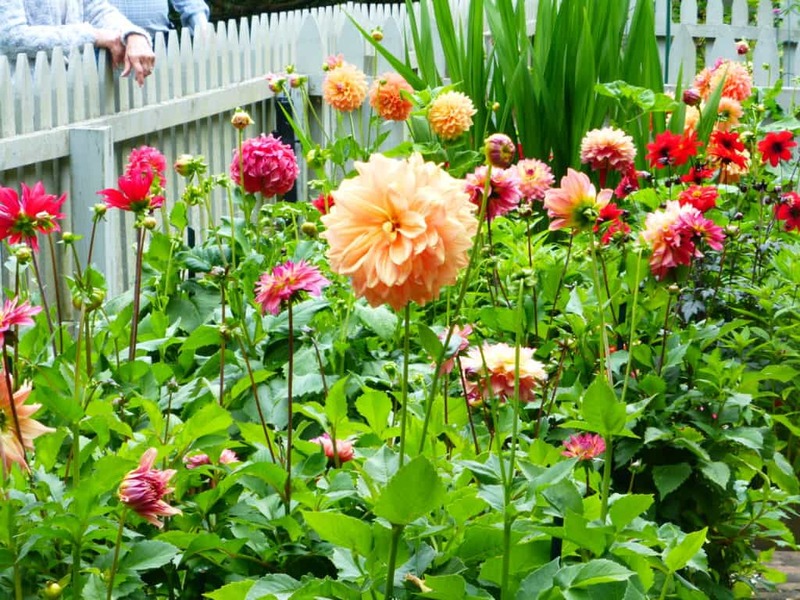 Such a gorgeous cutting garden. 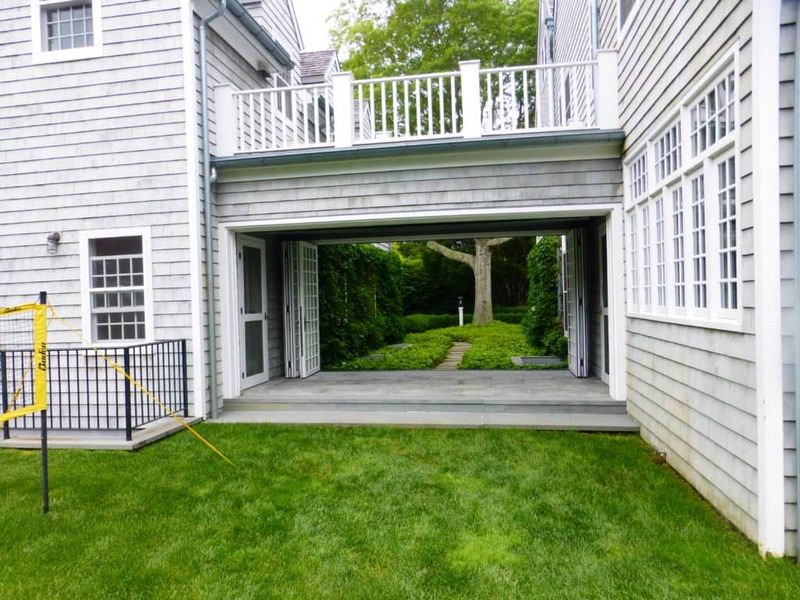 And then an intriguing space between the house and a separate structure, connected by a walkway that can be enclosed with folding doors and an overhead garage door in the colder months. What lies beyond is lush and peaceful. Another home on the tour is known as Bee’s Cottage. 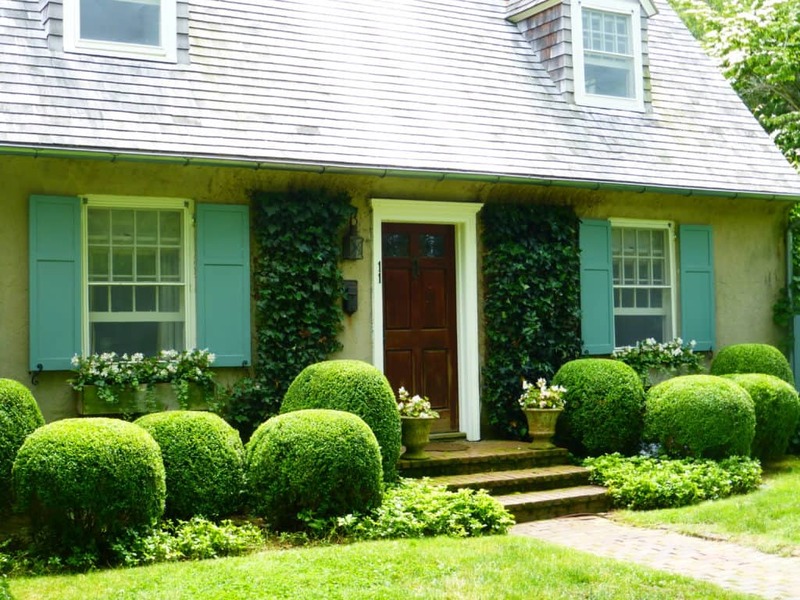 The stucco cottage with French green shutters and a boxwood edged lawn and begonias in the front door urns and flower boxes is perfect. In the brochure for the tour, the description, written by Alejandro Saralegui, says “If a garden can be described as a party dress, this is one.” Amen. 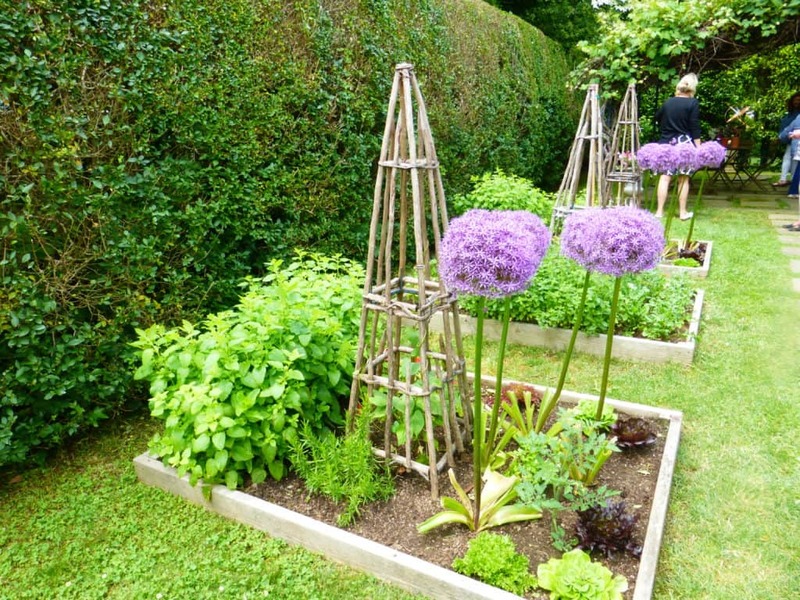 Hydrangeas, delphiniums, dahlias and others fill one end of the garden with two large topiary forms. 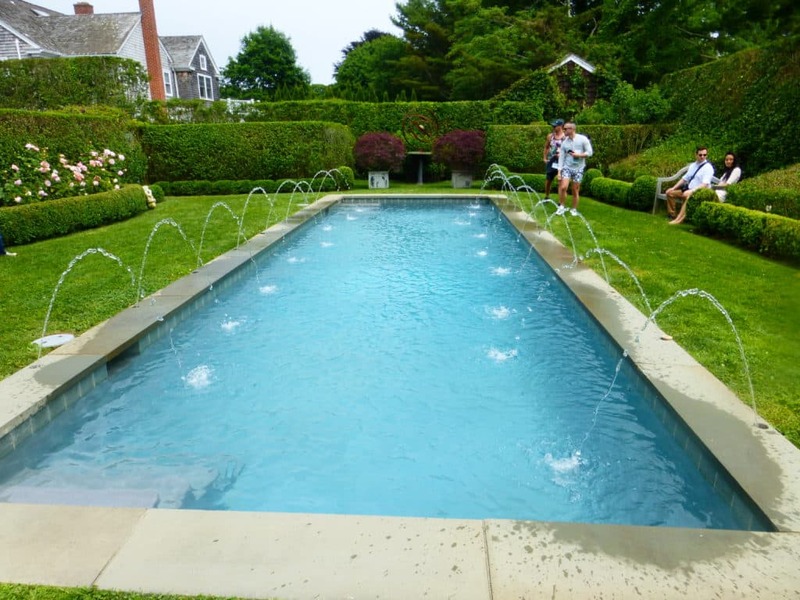 The pool garden is dramatic with sixteen jets shooting water into the air. Two Japanese maples in lead containers anchor one end. 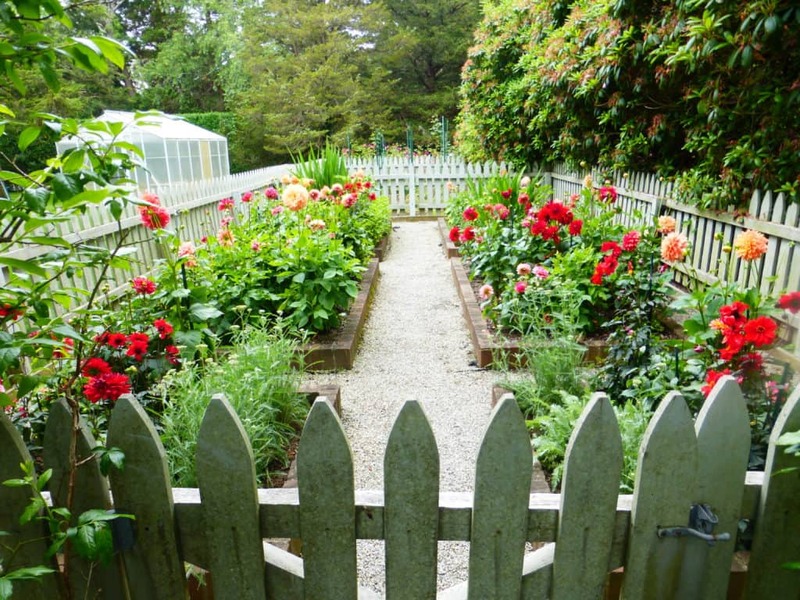 Three raised beds contain flowers and vegetables on the side of the cottage. And did I mention the covered slate terrace? Dreamy. I’m crazy about the colors used, along with the birdhouse full of plants on the wall and other interesting containers. 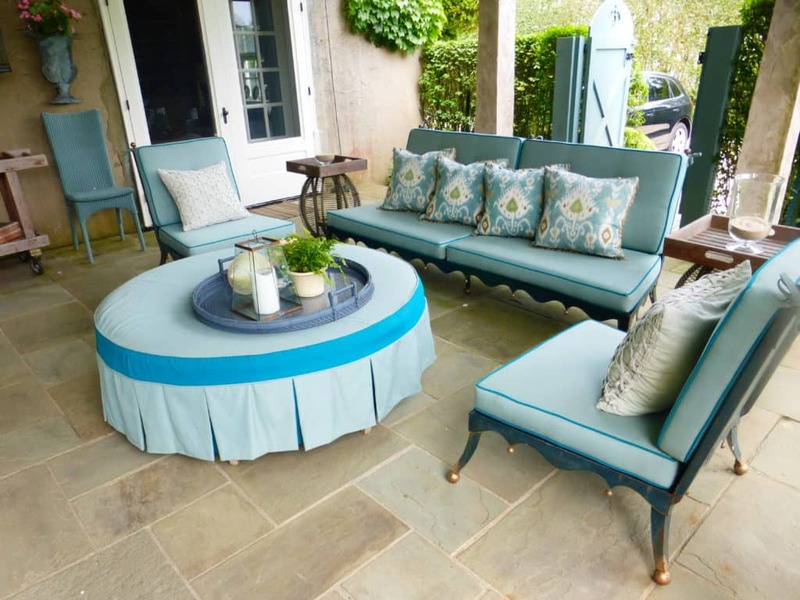 You can read about the renovation of this home and design of the gardens in the owner, Frances Schultz’s memoir, The Bee Cottage Story. I’m a new fan. 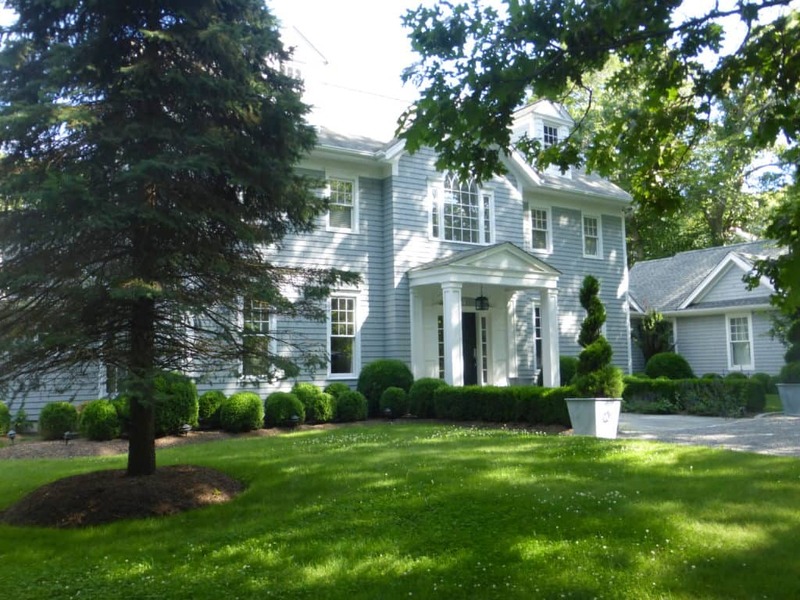 And then there’s Missy and Andrew’s home near Sag Harbor in North Haven. 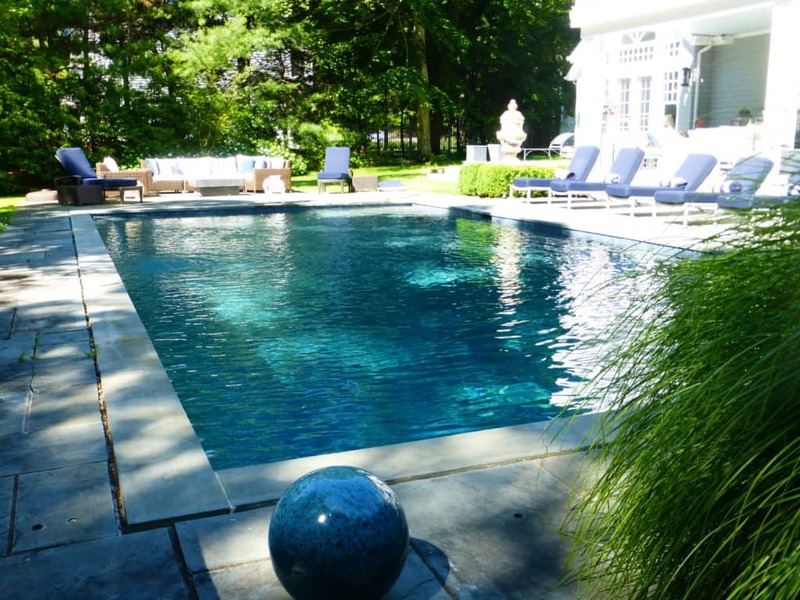 The back yard is an oasis with a gorgeous pool, lawn, sun deck and multiple areas to lounge in. The view from our terrace off the guest suite upstairs. 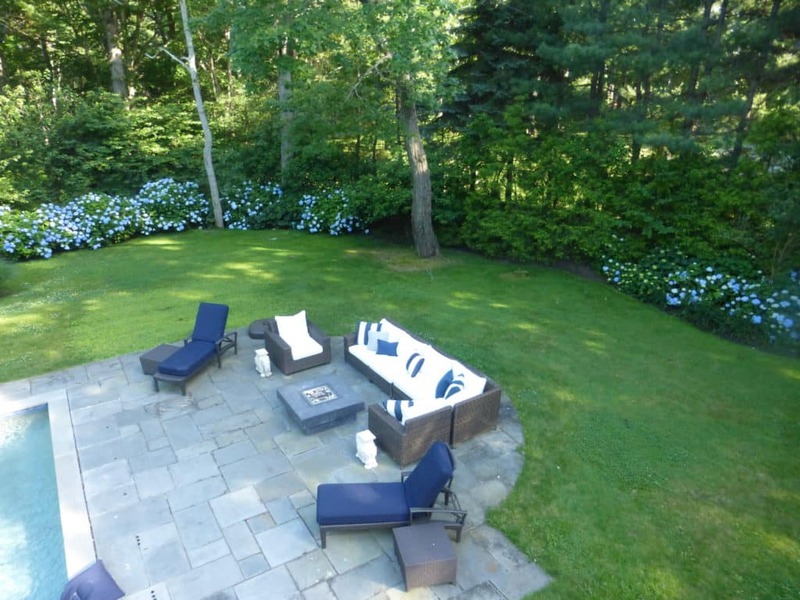 I can’t get enough of the deep blue hydrangeas. 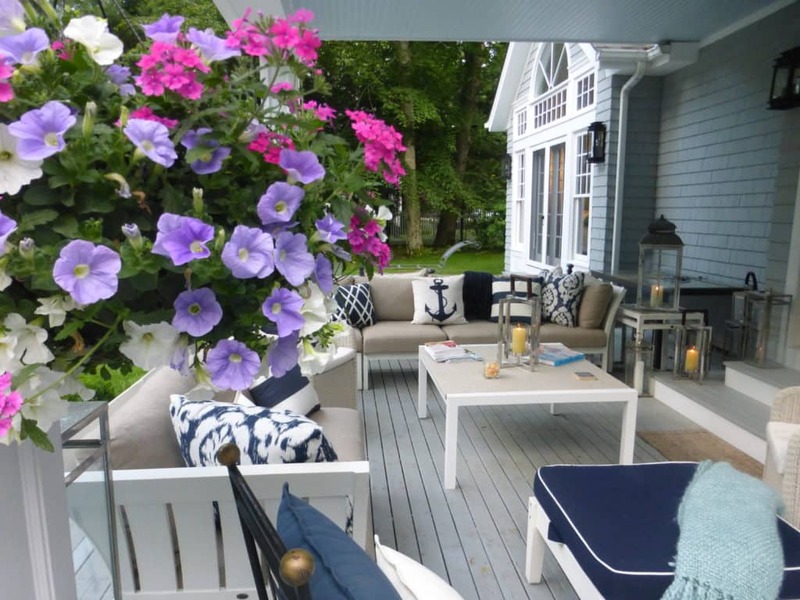 We’re trying to create this look at home in our back yard with the hydrangeas tucked under a row of trees. But sadly, we don’t have the stunning pool. We spent most of our time around the pool since the weather was perfect. But the other main gathering spot was, as you might expect, the kitchen. 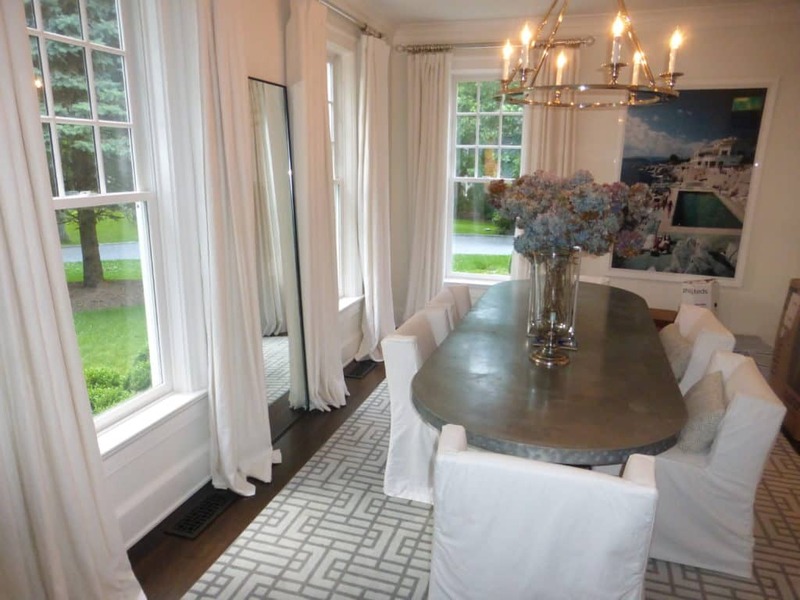 They did extensive renovations to the home, knocking out walls, painting everything white, adding new, mostly chrome light fixtures and completely updating the kitchen and adding a master suite downstairs with an additional half bath. 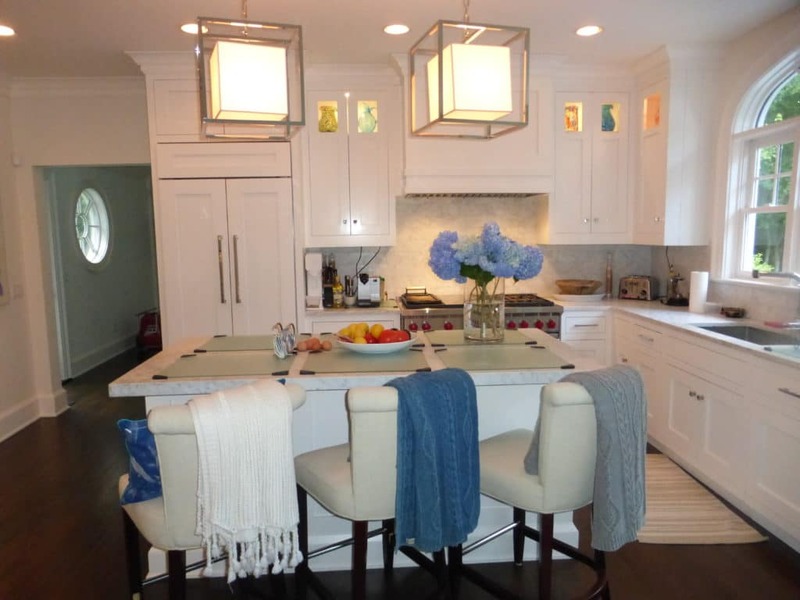 The color of the cabinets in the kitchen is Simply White by Benjamin Moore. Walls are Moonlight. It’s a clean bright white with which to display their amazing art. 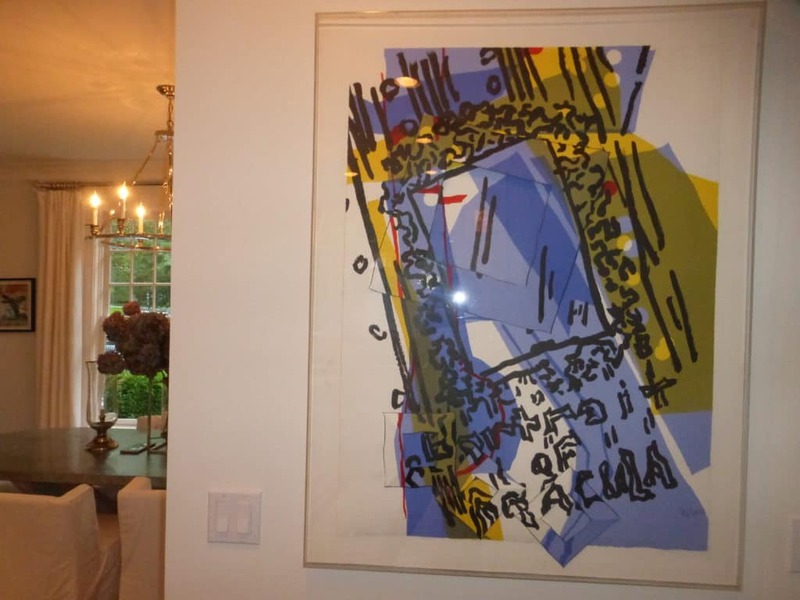 The unusual piece on the kitchen wall is actually a five color lithograph and collage, called “Portrait of Dracula” by Judy Rifka. 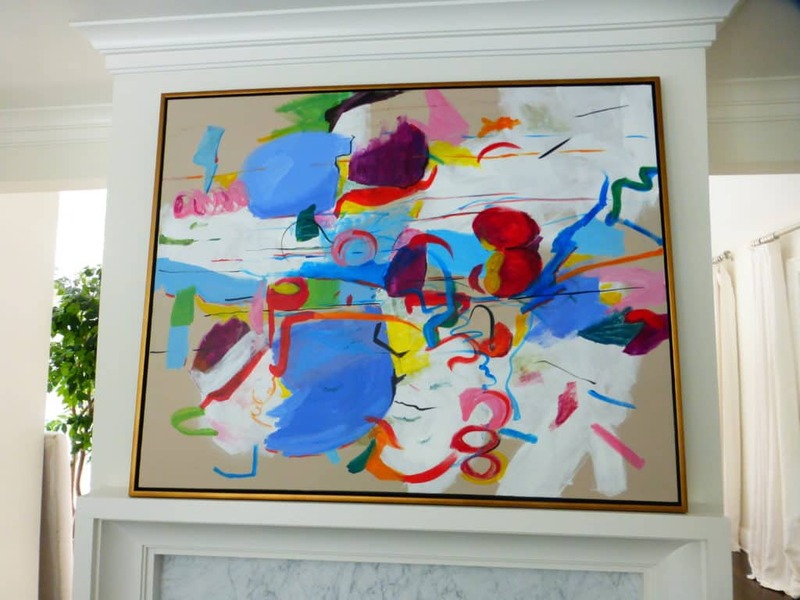 But the majority of the abstract paintings throughout the home are done by Missy, an extremely talented artist. She painted the piece over the fireplace in one night. It represents streamers and is such a happy painting. This is the view from the kitchen, looking through to their two dens. 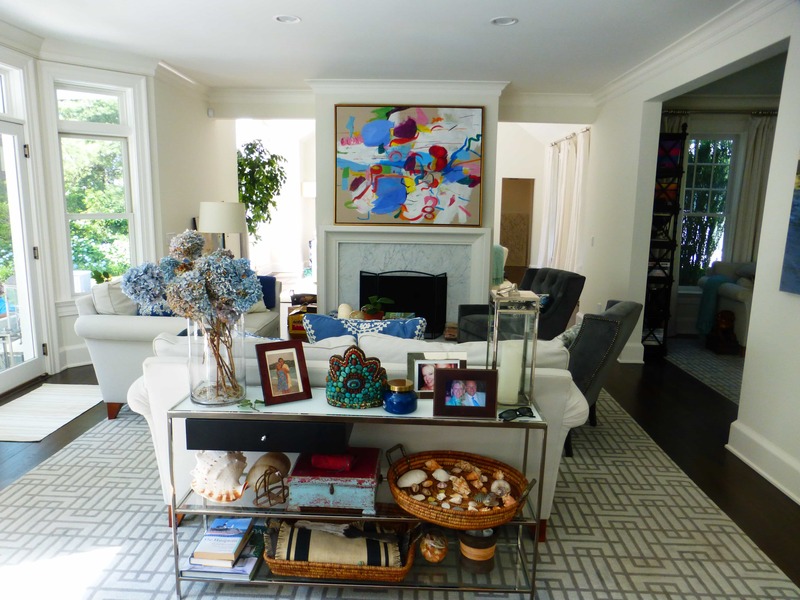 I love her choice of accessories, like the basket of shells and a unique turquoise Tibetan crown on the console table. The second den is quite soothing with its neutral palette. Just a few pops of color. And another painting by Missy. It’s the only room downstairs with a television except the master bedroom. 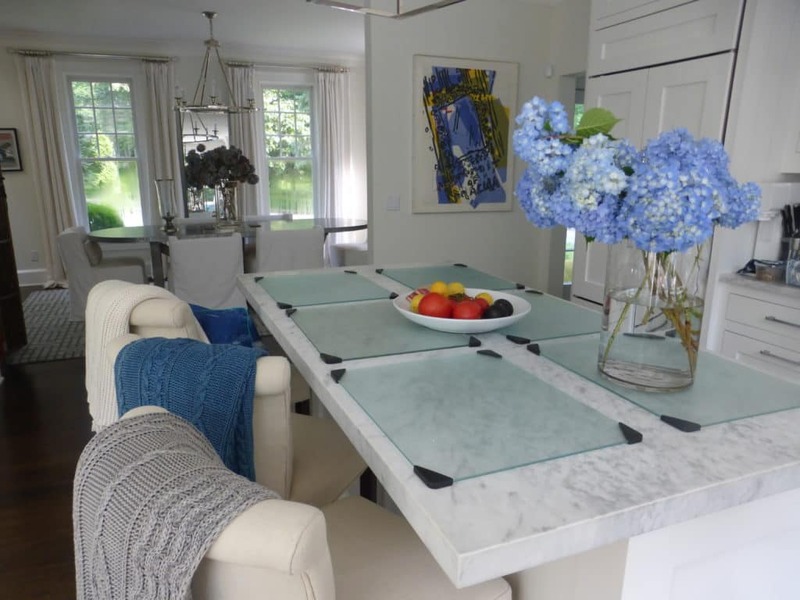 I love the entire house, but one of my favorite spaces is the dining room with its large zinc topped table. 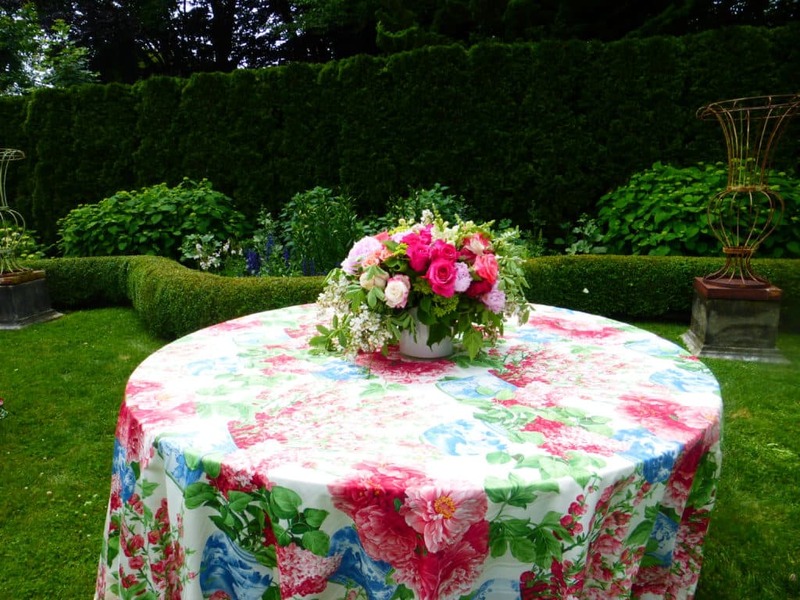 They purchased it in Sag Harbor at Black Swan Antiques. The curtains throughout the downstairs came from Restoration Hardware. 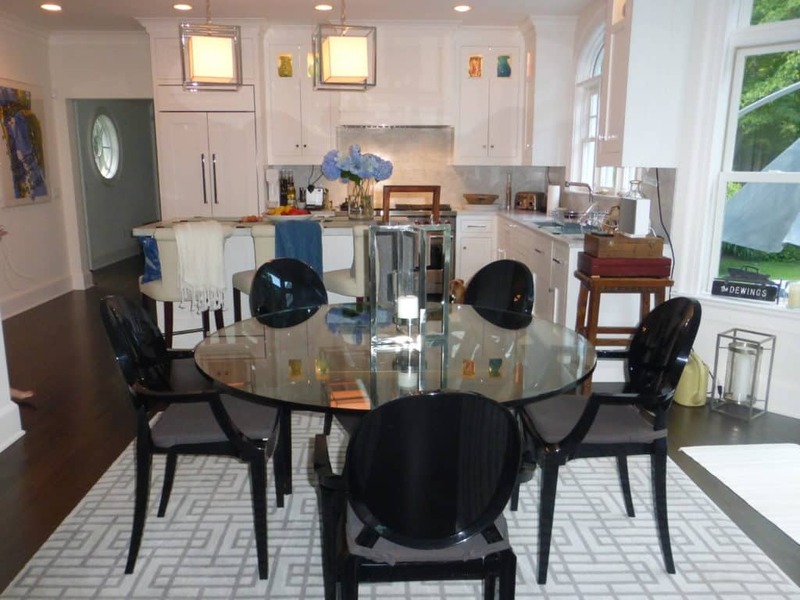 Light fixtures were purchased at Suffolk Lighting in Southampton. It’s hard to believe the house was painted dark colors inside before Missy and Andrew moved in and started their renovations. 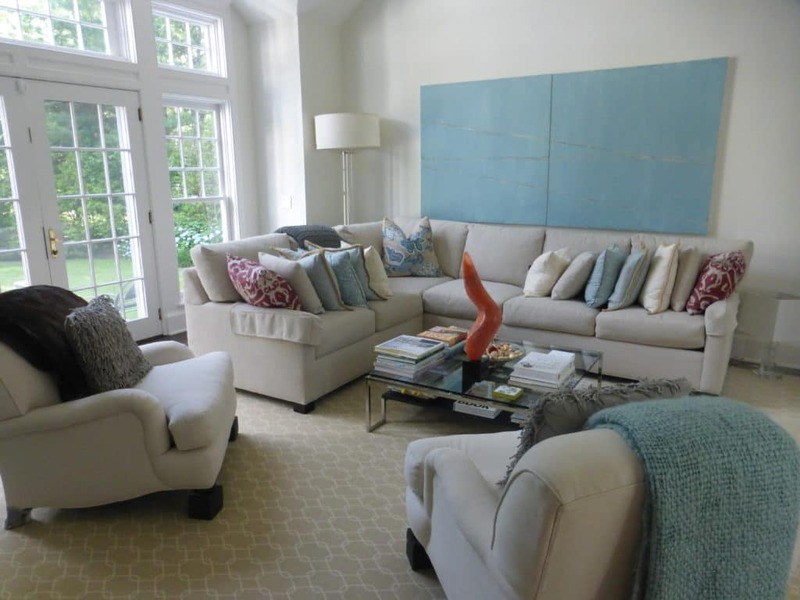 They’ve done a magnificent job creating such a light filled, stunning home. 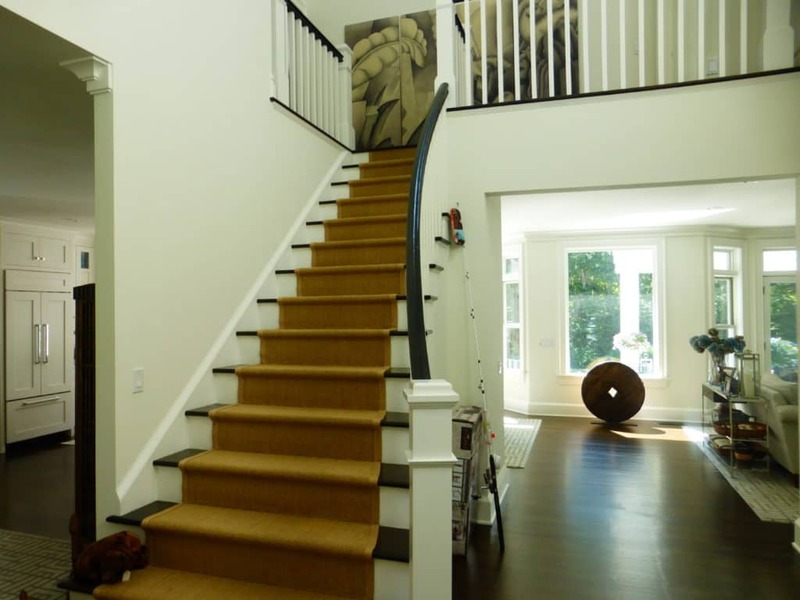 And that also included a new staircase and curved railing with a cathedral ceiling in the foyer. We had a luxurious bedroom to lounge in during our stay. And it, too, included some of Missy’s art. 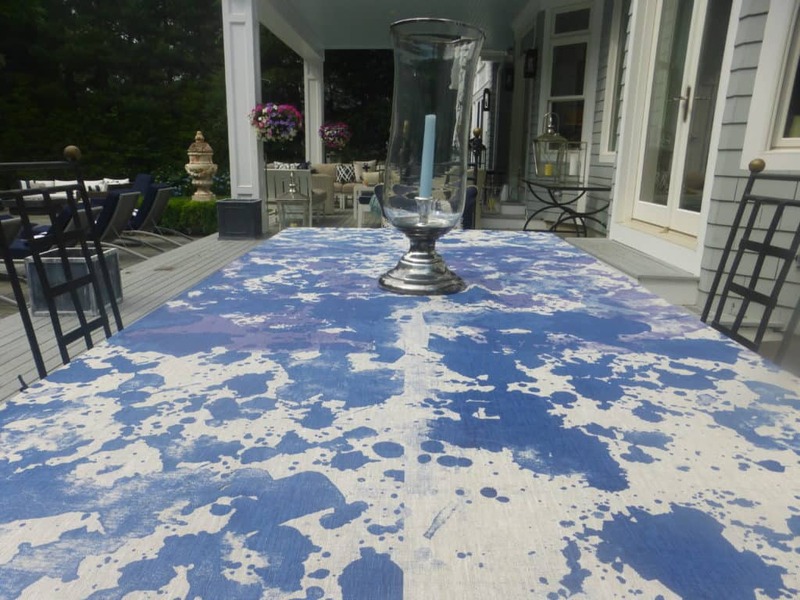 We found several great stylish items while I visited, including this stunning tablecloth that actually resembled a drop cloth a painter might use. 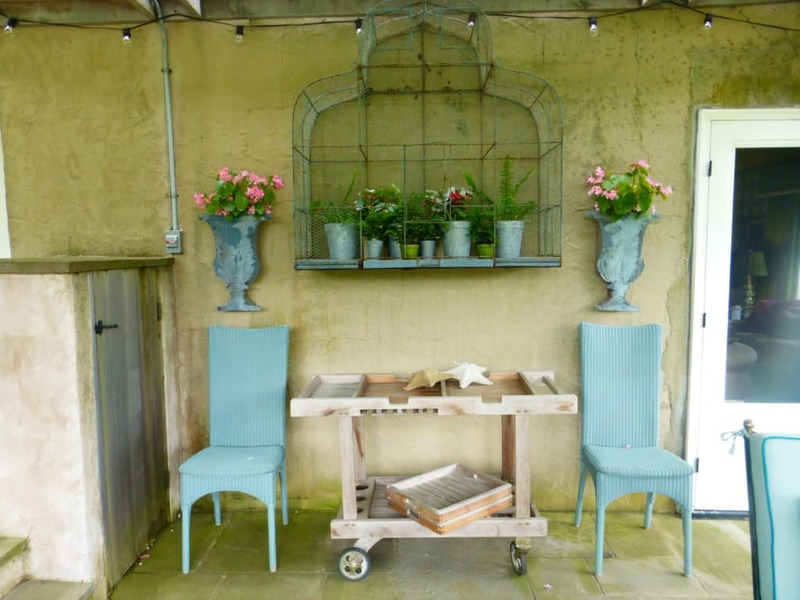 It came from Marders in Bridgehampton, one of the most interesting garden centers I’ve ever seen. Several wonderful meals were enjoyed at this table during our visit. Lucky us. And lucky them; to have found and created a luxurious and restful place to relax and entertain in complete style. It was hard for me to pack up and leave, but all good things must come to an end. The memories and photos will have to suffice until our next visit. 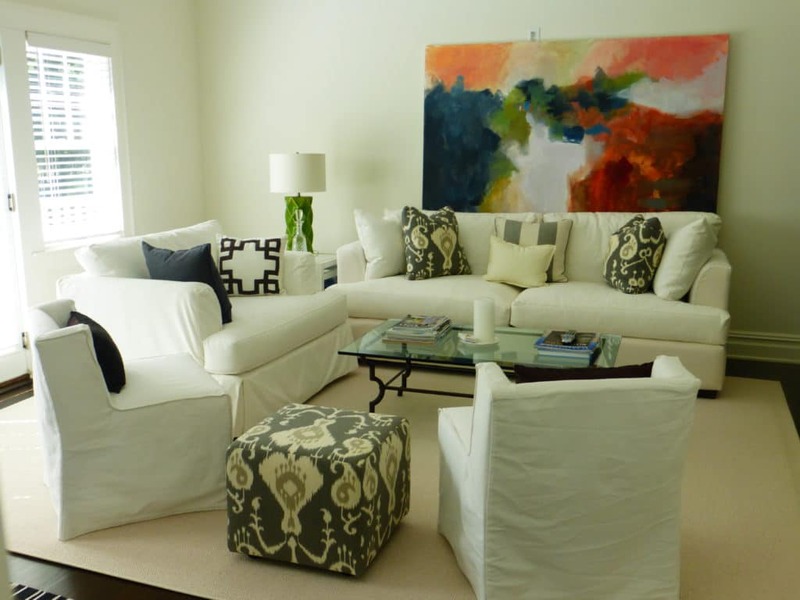 Thanks to Missy and Andrew for sharing their Hamptons heaven with Stylish Retreats. Lovely! Just lovely! 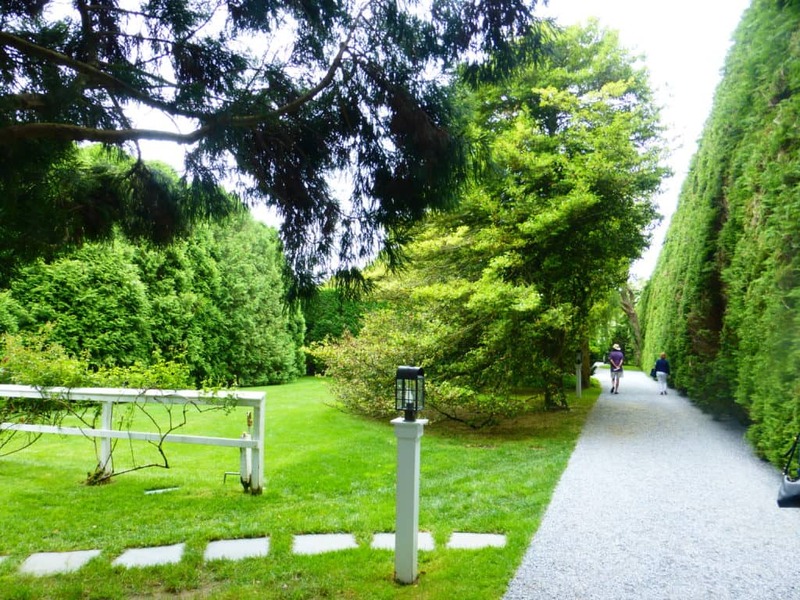 A trip to the Hamptons is a must for us!